Weighty Matters: Ontario's Former Minister of Health Promotion Now Flipping Burgers at McDonald's? 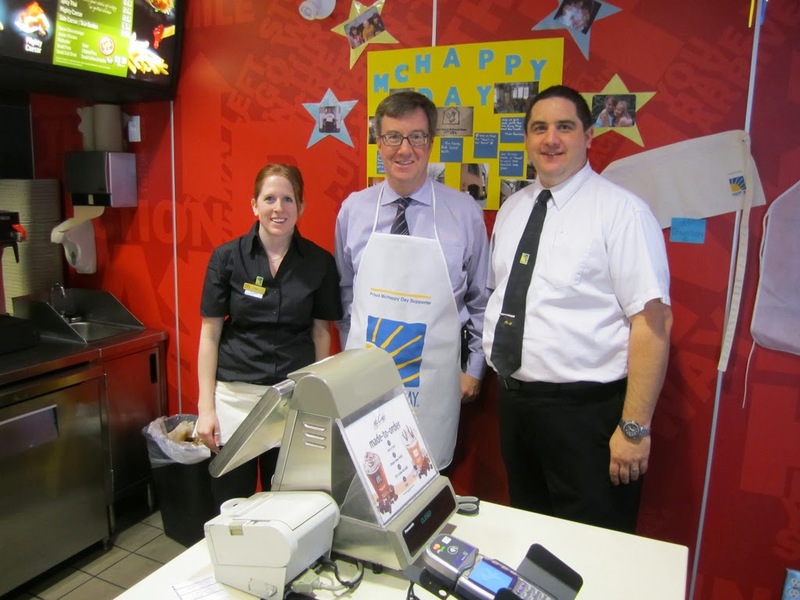 Ontario's Former Minister of Health Promotion Now Flipping Burgers at McDonald's? Former Minister of Health Promotion Jim Watson at a 2012 "McHappy Day"
"Mayor Jim Watson will be lending a hand flipping burgers at a McDonald's in Orleans this morning. Craving a Big Mac well what a better day to cave in then McHappy day. One dollar from every big mac, happy meal, and McCafe hot beverage will go to Ronald McDonald House and the CHEO foundation." Mayor Jim Watson, in case you haven't figured it out yet, is also Ontario's former Minister of Health Promotion Jim Watson, and so difficult to make the case that he's unaware of the health consequences of society's normalization of junk food and the charitable health washing of unhealthy brands. That said, maybe he thinks he's really lending a hand. Maybe he's unaware of just how truly detached McDonald's the corporation is from Ronald McDonald House the charity. This past fall Eat Drink Politics' Michele Simon put out a report entitled Clowning Around With Charity: How McDonald's Exploits Philanthropy and Targets Children where among many other revelations she revealed that the money McDonald's the corporation spent on just a two month television advertising campaign for Ronald McDonald House was in fact three times as much money as they actually gave to Ronald McDonald House that year. If this was about charity and not sales and charitable brand-washing you'd expect those numbers to be reversed, wouldn't you? There's no questioning the value of Ronald McDonald House Charities to those who need their services, just as there's no questioning the value they provide McDonald's in polishing their brand, creating good will and promoting sales and profit. There was a time when the tobacco industry gave generously in a similar bid to benefit from co-branded good will, yet now it would be unthinkable to donate or support a tobacco-branded charity. Perhaps the time is now to rethink co-branded food industry charities and charitable donations, and as Simon suggests, in the case of McDonald's, rename and rebrand Ronald McDonald House Charities and recognize that food industry money with strings that tie directly to illness may not be in society's best interests to continue to take – however worthy the cause. So here we have a Mayor and former Minister of Health Promotion and the CHEO Foundation further normalizing our toxic culture of convenience. Frankly I'd have expected more leadership from both.